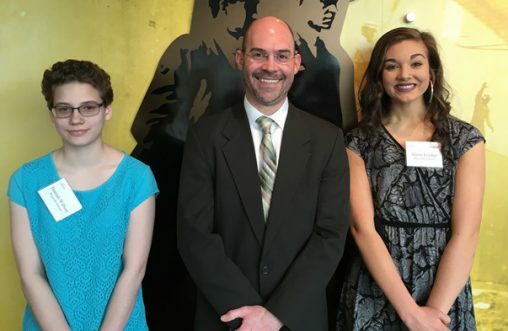 Nate Klingbeil, dean of the College of Engineering and Computer Science, with Reynolds and Reynolds Leadership scholars Hannah Wilburn, left, and Alexis Frasher. Eight incoming engineering students have been awarded the latest round of scholarships as part of the Reynolds and Reynolds Leadership Scholars Program at Wright State University. The students, who will enter Wright State’s College of Engineering and Computer Science in the fall, are high achieving high school graduates from around the state. The scholarship awards were announced April 27 during the college’s annual awards ceremony at the Student Union Apollo Room. Since creating the Reynolds Scholars Program in 2009, Reynolds has provided $740,000 in scholarship funding awarded to 74 incoming students enrolled in computer science and computer engineering programs at Wright State. Each student receives a $10,000 award payable throughout the four years of their academic program. Each new cohort of scholars is hosted by Reynolds and Reynolds for a tour of the Reynolds campus and the opportunity to meet employees in key leadership roles. The visit includes an in-depth look at Reynold’s unique Customer Innovation Center. The Reynolds and Reynolds Company Foundation focuses on giving to programs in higher education to prepare quality students for key roles in regions where Reynolds has a significant presence. As one of the oldest corporate citizens headquartered in the Dayton region, Reynolds’ support of the Leadership Scholars Program also dovetails with Wright State’s mission of transforming the communities the university serves.